Since 2014, Allies in Hope’s philosophy on fundraising and giving back to your community is that it should be unique and fun! We view ourselves as “fun”-raising consultants where we partner with other children’s charities to help them raise funds and awareness. Who wouldn’t want to dress up for a theme party or compete in a wiffle ball tournament to raise money for kids?! Fun events keep people engaged and coming back. We host and run the events and all net proceeds from the event are donated to the featured charity. As we grow our member base and partnerships with other children’s charities, we hope the positive impact we can make on improving the lives of children will continue to grow as well. 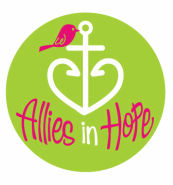 Allies in Hope is a group of dedicated individuals committed to improving the lives of children. Our mission is to raise awareness and funds to support children’s charities. To be a creative fundraising organization dedicated to having a great time while supporting great causes.